This is a craft/snack that my children made at the Hebrew Academy of Tidewater in Virginia Beach, Virginia. It was a great hit with all that saw/ate them. With the updated recipe now posted on the right. I realized I should point out that there are other chocolate spreads and other sugary things that are Kosher and do not have peanuts. Some may be dairy. Any sugary substance can be used as the "glue". I wonder if Marshmello Fluff could be used? (Sukkah 2004 here we come!) Or better yet... Chocolate and Marshmello Spreads! Some of the thinner pretzels are actually marked O-U Dairy but I could not find anything dairy in them. May be dairy equipment. As with any food projects please check with your Rabbi when you are not sure before bringing food into a building. Paper/foam plate to carry/build on. Dixie fruit design paper plate looks great. Mark with a permanet marker their name on the plate. Take your finger/plastic knife/popsicle stick and dip into the peanut butter. Apply to edges of graham crackers. Use as glue to hold two cracker together length wise. Make the three crackers stand in a U shape. 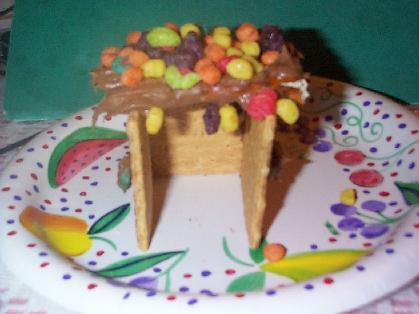 Take some Trix dip into peanut butter and stick onto the inside/outside walls. Take pretzel sticks and add peanut butter all around a pretzel stick. 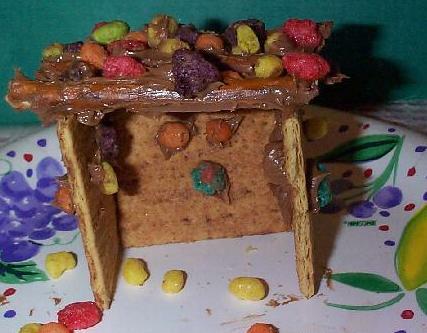 Stick Trix onto pretzel and lay on top of crackers to make a roof. Repeat with remander of pretzels until the roof is covered. (remember to leave a little space between pretzels to be like a real Sukkah and have open space to "See" Sky. I love to hear that people use my web pages in classes and at home. Lisa wrote that she used the idea with some modifications at her son's 5th birthday that was during Sukkah. I agreed with her that the peanut butter was sometimes hard for little ones to use as a glue. She reminded me that many pre-schools and schools were not using peanut butter since the information about allergies and the danger of even breathing near peanuts for some people. She came up with this recipe. Still won't help those with wheat/sugar allergies but might help others. Recipe and Supplies for Sugary "Glue"
Basic Royal Icing also used in making gingerbread houses. 3 tablespoons Wilton Meringue Powder (has 'OU' certification) - it is available online or at craft/baking stores. Lisa suggests not try to make more than one batch at a time, (i.e. double the recipe) because the stuff is so heavy that it will burn out your mixer. Also, add the water slowly. You can vary the consistancy by adding more or less water, but the consistancy also changes the longer you beat it so don't do it prematurely. The less water, the thicker (and less sticky) the icing is. It will also dry faster. When she says thick, she means like play-dough. If you want the glue to have a color then add some food coloring. Lisa suggests brown to match the crackers. Put a dollop in each bag and seal with rubber band. She suggests you can make this up in advance but not to expose it to air as it will harden if the air gets it. Cut a corner off of the bottom of each bag so the kid's can squeeze it out like toothpaste just when you are ready to start gluing. Extra fun! 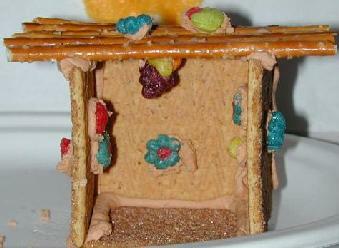 Use a cinnamon graham cracker and place with cinnamon side up to look like the earth on the floor of the sukkah. Lisa said you can even do another edible craft by making the icing really thick on purpose, dying it different colors with food coloring and allowing the kids to make "clay" creations that they can eat as candy later when it is dry. If you have any crafts that you would like to share email me. I would love to post your ideas giving you credit of course. See My Jewish Resource page for more Sukkot information. See my new page Sukkah Crafts for more information and crafts.